New York City produces millions of tons of trash every single year thanks to its 9 million inhabitants and many more commuters and tourists, so where does it all go? Every night an army of garbage trucks enters the city from New Jersey, Long Island and Westchester County to haul it away and dump it in landfills, most of which are quite far away and in other states. For now it seems to be the only solution despite being fairly inefficient and incredibly expensive for the city government. The other day my friend sent me a link to an article that has a bold and interesting idea: compost parks on the city’s waterfront. In short (you can read further details via the link above) a series of structures would be built along the Hudson and East Rivers across the city. 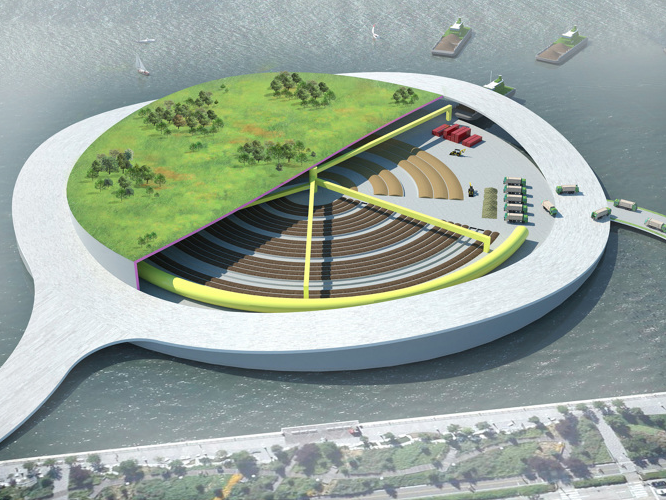 On top would be parks, underneath would be an organised system for composting the waste of New Yorkers. Most unused food, paper, cardboard, cartons, etc. can slowly compost over time thanks to a process of being broken down by bacteria. The result is compost, which can be used as a natural fertiliser. These compost parks would have biodegradable waste delivered by trucks for processing, greatly reducing the distance, time and energy needed to send the waste farther afield to Pennsylvania, Ohio, or wherever else your three week-old Chinese takeout currently ends up for retirement. The supporters of this system claim a few key benefits: composting is environmentally friendly as it recycles waste; the close location would reduce truck emissions and fuel burn; the park acreage would bring much-needed green space to the doorsteps of many New Yorkers. I’m for all of that – but I have some questions. What kind of capacity do these structures have? According to the article featured on Present Architecture NYC produces more than 14 million tons of trash every year. Granted, much of that is not compostable and hopefully a lot of it is recyclable, (under Mayor Bloomberg the NYC Department of Sanitation greatly expanded what can be recycled) so perhaps a system of these parks would suffice, but I would still like to see some data. What about odour? A giant compost structure sitting right off the edge of Manhattan sounds to me like a pretty smelly place. Wouldn’t people in the park smell everything rotting beneath them? Would there be enough airflow down below? I am no expert on compost so perhaps it does not smell as bad as I think, but I can tell you that the banana peels, forgotten leftovers and that three week-old Chinese in my bin certainly stink. Someone please correct me if I am wrong on this. How about traffic congestion caused by the trucks going to and from these structures? I currently live near the entrance and exit to the Lincoln Tunnel, which isn’t exactly quiet, at best a dull roar. Long after the commuter busses and those silly people who actually drive to Manhattan (seriously, why???) are gone, I am greeted by the cantankerous encore of the garbage trucks coming in from New Jersey, only to return a few hours later just before the morning rush. Wouldn’t having these compost centres all over the city create a concentration of noisy, polluting trucks right by a new and beautiful park? Lastly I am concerned about safety and durability of these structures. As Hurricane Sandy showed us all, even Gotham isn’t immune to the forces of Mother Nature. Could one of these structures, right in the middle of densely populated areas and on the water, be able to withstand the bashing of a major storm’s waves, surges and winds? My fear is that composting waste would be washed into the rivers, both polluting them and creating navigation problems for maritime traffic. I would assume that the designers of these structures would prepare for such occurrences, but I don’t like assuming. Despite my questions I find this idea to be incredibly innovative and unique as a possible supplement to NYC’s waste management system. While certainly not capable of transforming the way the city disposes of its waste, it would have multiple benefits. Getting them built is one thing, getting New Yorkers to learn how to sort their trash into separate bins is quite another. Previous Previous post: Subway Station Signage: Is it enough; is it helpful?